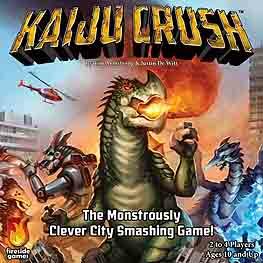 Giant monsters have gathered to determine which Kaiju is supreme! Crush buildings for points through limited grid movement. Earn in-game bonuses and gain extra points for locations of crushed buildings, numbers of City Tiles claimed, and specific patterns formed. When another monster is nearby, fight! Use brains and brawn to claw your way to victory!